Powerful, marine-based formulations rife with pure essential oils lie at the heart of these impactful treatments. 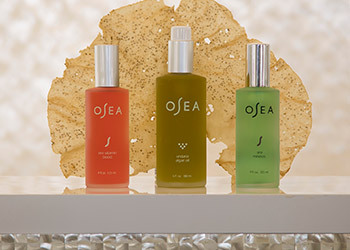 Infused with the healing properties of the sea and the most effective ingredients of nature, these OSEA spa services foster radiance, vitality and inner harmony. Hot and cold elements create a polarity that stimulates circulation, activates cellular regeneration and reverses signs of aging. A firming eye treatment with a customized masque—layered with wild Gigartina algae—and a hydrophilic facial massage feed and nourish your skin. This service includes an anti-aging hand treatment and light foot massage. A personalized skin analysis determines skin condition and a facial is customized based on your needs. Marine serum blended with sea oxygen repairs and soften fine lines. Deep sea mud draws out impurities and restores your skin’s original, healthy pH balance. Rich with antioxidants, this purifying experience is ideal for dull or mature skin. Pure Vitamin C blended with Hyaluronic Sea Serum penetrates the skin and instantly reveals a luminous, youthful glow. An organic bio-scrub, infused with Lavender Salts of The World, exfoliates, conditions and softens your skin. Complete with a blissful neck and shoulder massage. A one-of-a-kind body polish smooths away surface impurities while gently encouraging healthy skin elasticity.